rec. September 1968 (Variations), October 1971-February 1973 (Symphonies), March and August 1977 (Poems), November 1979 and February 1980 (Overtures), Rudolfinum, Prague. 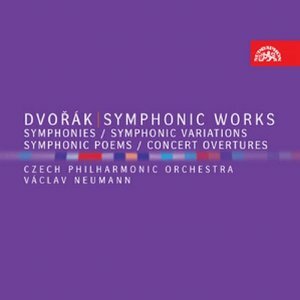 Strangely, this was the first cycle of the Dvorák symphonies to be set down in then-Czechoslovakia with the Czech Philharmonic Orchestra under a single conductor and recorded by the state record company Supraphon. Or maybe it was not so strange. The cult of the “complete cycle” reached Czechoslovakia late and Supraphon tended to spread its Dvorák recordings among the several leading national conductors of the day. The reasons also cast an interesting light on the distortion resulting when a country has sealed borders and a state-controlled economy. In his notes to the Supraphon reissue of Karel Ancerl’s 1961 recording of the New World Symphony (SU 3662-2 011), Bohuslav Vitek explains that in Czechoslovakia, Václav Talich’s final recording of this work (1954) not only enjoyed iconic status but was in fact, from 1954 until 1961, the only one on the Czech market, or available for broadcasting. The average Czech music-lover was therefore blissfully unaware that, outside his country, the work had been recorded hundreds of times, though Ancerl must have known, since he himself had swelled the ranks of “heathen” New Worlds when he set it down for Philips with the Vienna Symphony Orchestra in 1958. The decision to replace Talich’s mono account with a new stereo one was therefore a major event in Czechoslovakia, and Ancerl is said to have re-studied the score for the occasion. Talich’s Dvorák 8 went unchallenged for the time being, but his 6 and 7 were pre-war so the task of replacing them in the early 1950s went to Karel Sejna, who also made a much-loved version of the 5th. In those days the Dvorák symphonies were still numbered 1-5 and the early four were apparently considered unworthy of the great Czech Philharmonic. They were therefore farmed out to the Prague Symphony Orchestra under two rising talents: Václav Smetac(ek, who made a fiery version of no.3, and Václav Neumann, who set down nos. 1, 2 and 4. Ancerl later made a stereo recording of no.6. A complete cycle was probably never envisaged since a stereo seventh was made at about the same time under Zdenek Košler, while Talich’s elderly readings of the four Erben-based symphonic poems got a stereo replacement under Zdenek Chalabala. Any further plans involving Ancerl were crushed by the Soviet invasion of Czechoslovakia in 1968, following which the conductor fled to exile, dying five years later. Ancerl had not always been perceived as on the side of the angels. His original appointment to the Czech Philharmonic in 1950 was resented at first, since he was seen as a party hack usurping the place of Talich, who was thrust to the sidelines for political reasons, and Sejna, who was the heir-apparent but who had also run foul of the political authorities. Something of a similar process also affected Neumann. At the time of the Soviet invasion he was conductor of the Leipzig Gewandhaus, a post he resigned in protest against East Germany’s involvement in the invasion. Some suggested he did rather well out of it, since he returned home to pick up his country’s top conducting job, raising all the old questions as to whether it is better to turn one’s back on an odious regime or to stay put and keep the torch burning. By the time of the “Velvet Revolution” Neumann was certainly on the side of the angels and appeared as a sort of cultural ambassador to free Czechoslovakia. Not long into the puppet Husák regime, therefore, the decision was made to set down the first all-Czech integral cycle, gradually embracing much of Dvorák’s other orchestral music - more than is contained in this set of “symphonic” works but stopping far short of a systematic exploration of everything he wrote that needs a conductor, something that ought to have been done by now but never has. Unfortunately, the new Neumann set got a dusty reception in the west, or at any rate in Great Britain. The west itself had been busy. The first Dvor(ák symphony cycle under one conductor was a notable fruit of István Kertesz’s tenure with the London Symphony Orchestra (Decca). Roughly contemporary with most of it, but taking longer to complete, was Witold Rowicki’s cycle, also with the LSO (Philips). Not long after came the Berlin cycle under the exiled Czech conductor Rafael Kubelík (DG). Some other notable cycles have been made, but discussion of Dvor(ák symphonies on record still tends to start from these, maybe with a nostalgic look at the old Talich-Sejna recordings. First to arrive from Neumann were separate issues of nos. 5 and 8. Edward Greenfield (Gramophone 9/74) felt that “These are plainly players who know the music very well, but curiously do not seem to have it in the blood”. He objected in particular to the “even stressing of rhythms”, as a result of which “the lilt of Dvorák’s music … is somehow missing”. He was no happier when the complete cycle hit his doormat a year later (Gramophone 10/75): “… there is no sense of expectancy, and the even stressing of the rhythms quickly makes for a deadening effect. … one’s attention inevitably wanders largely because of the rhythmic shortcomings”. He did find the 7th an exception, finding that “it captures the exhilaration of this masterpiece”. The EMG Monthly Letter could often be relied upon to disagree with Gramophone, but not here: “Compared in general with Kertesz’s series, this one is somewhat undervitalized … One sometimes gets the impression that the splendid Czech orchestra is being frustrated by a somewhat dull conductor” (8/75). Neumann’s conducting was not always admired, in fact. I remember reading, in my university years, a book on conductors by David Wooldridge which had words to the effect that work in Leipzig - the book was written before 1968 - was hampered by the fact that Neumann “is not really a conductor at all”. The younger Neumann got kudos from the London press when he conducted a plausible performance of Elgar’s Falstaff at the Festival Hall, but when his later self directed Beethoven’s 5th in the same hall a critic noted that the orchestra seemed not quite sure “where the click in the Neumann beat came”. The noted Italian critic Piero Rattalino, in his essay for an issue of an Ancerl New World live from Lugano in 1958 (Aura AUR 151-2) came up with an interesting theory. While recognizing Neumann as a fine conductor of Mahler and Martinu* he noted that “… with Neumann, something in the great Czech tradition was broken, or at least diminished. … It’s an old historical truth: a great cultural endeavour exhausts itself in the course of 60 or 70 years.” Rattalino had previously traced the history of the Czech PO from its inaugural concert under Dvor(ák himself in 1896 through Nedbal and Talich to Anc(erl - “the last heir of Dvor(ák”. More recently David Hurwitz, in an internet review, chose Neumann’s later digital cycle on balance as the best, over Kertesz, Rowicki and Kubelik, while noting that Neumann in general had a tendency towards “a certain stiffness”. This latter sounds like another way of describing Greenfield’s “even stressing of rhythms”. In March 2004 Gramophone paid handsome amends for its earlier dismissal when Tully Potter contributed a substantial article on the conductor to their “Reputations” series. In particular, Potter noted of that original 5th and 8th coupling that “many of us had never heard passages such as the second subject of the Fifth’s opening movement played so beautifully” and that the Eighth “was alternately joyous, lyrical and springy”. I apologise for a number of quotations dragged from my memory without proper references, some of which would be hard to track down. I think I have sufficiently shown that Neumann’s Dvorák originally had a fairly rough ride from a wide variety of sources. I would add to this my own earlier reactions. I heard the 8th on the radio while it was still fairly new and was dismayed at such a plain-sailing account. Later broadcasts of the 7th and 9th appealed to me more. In the late 1980s I had to give a talk in Milan on Rusalka. At that time my beloved Chalabala set was still in London and there wasn’t time to send it out, so I bought the only version I could find - the new Neumann. I was again disappointed at what seemed to me a flatfooted literalness. Around 15 years later I reviewed a reissue of the Chalabala Rusalka for MusicWeb International, and made a section-by-section comparison with the Neumann. To my amazement and puzzlement, the comparisons didn’t lead at all where I had expected them to. In the passages of woodland and fairy magic that lie at the heart of the score, Neumann really yielded very little in poetry to Chalabala, while he was far more responsive to the other aspects of the music, the intrusion of human beings, the mutterings between the gamekeeper and the turnspit, the treachery of the foreign princess and so on. Chalabala seemed less at home in this material and cut quite a bit of it out altogether. So I had to conclude that Neumann’s was the more complete vision of the opera. So at this point, what about the symphonies? If Neumann represents a departure from Czech tradition - and the variegated comments above all seem to agree on that - does he have something to say that previous conductors left unsaid? I started with no. 8, perhaps the most totally individual of these symphonies in its colouring and construction. Straightaway we come up against the question of the “even pacing of the rhythms”. This is something that is going to affect listeners in different ways. Years ago Edward Greenfield himself offered a useful definition of “accelerando conductors” and “rallentando conductors”. Useful, that is providing it doesn’t preclude a third type, those who do neither but for whom tempo is not inherently a means of expression but a constant against which all the events in the music take place. Neumann is one of these, and in this sense might be likened to Erich Leinsdorf, another conductor who is great for some and pedantic for others. Though Leinsdorf’s tempi were generally faster, his textures leaner, so one couldn’t mistake one for the other, least of all in Dvorák 6, of which Leinsdorf was a convinced advocate. At the outset of no. 8, then, the Czech strings are pliant and beautifully moulded while the pizzicato bass line is as even as in a Mozart serenade. The music is thereby set on a rhythmic trajectory that unobtrusively but inevitably governs the whole movement. The flute solo keeps in tempo, there is neither accelerando in the ensuing crescendo, nor any holding back, the brass blaze and chatter and there is a great sense of orchestral involvement. By avoiding easy euphoria or overt charm, Neumann reveals unsuspected shadows in the work, just as he did in Rusalka, human encroachments in the idyllic nature world. The pauses in the second movement look ahead to Sibelius, the third movement is elegiac as well as gracious - Neumann is unfailingly responsive to dance rhythms - while the trumpet fanfare at the opening of the finale is not just a call to the fair. It is more ambivalent, even menacing. It used to be an article of faith with me that nobody would ever wean me off Kubelik’s volatile, exuberant, lovingly embraced Berlin PO recording. Maybe it was also an article of faith with me that Dvorák, and his 8th symphony in particular, is one of those teenage fads that never go stale. Well, Neumann has helped me grow up. If you want to hear a Dvorák 8 that relates to Mahler as well as Janácek, go here. I think this is the version I’ll return to now. It was an inspired choice to put the overture sequence on the same disc. Here again, Neumann is alive to the ambivalence. Human activity encroaches upon nature in the first overture, the human life of Carnival longs to escape to nature, while raw emotions reign in Othello. Dvorák’s suggestion that these overtures might be played together as a substitute for a symphony makes sense to me at last. Rather on the lines of the 8th is the reading of the 5th. The opening arpeggio motif breathes all the nature poetry we expect, but when it later comes on the horns the human hunters invade the scene. Later still it is heard on the trumpets and uncomprehending royalty dominates. The finale of this symphony is one of the most original written in the late 19th century and one of the few to get right away from the Beethoven-Brahms model. The brutality with which the A minor material erupts and attempts to hold sway, subsiding only in the last stages to the nature poetry of the opening, is superbly portrayed by Neumann. Neumann’s 7th, at least, has always enjoyed a good press. Crucial to its success is his feeling for tempi, so that the music is dramatic, lyrical, tough and dancing by turns without being either taken by the scruff of the neck or allowed to lumber. If I may take one example of Neumann’s insights, listen to the opening of the second movement. Amid the pastoral calm of the chorale-like theme the bassoon line is allowed to wander like Elgar’s “malevolent spirit”. At this point I should say that the old Czech PO sound, with its warbling wind and vibrant, deep-bowed strings was still intact in those days and contributes pungently to the whole cycle, not least at this point. Neumann’s 6th, on the other hand, has drawn plentiful flak. It is true that it is unusually broad in the outer movements but I do not find a lack of conviction. The very opening of the symphony is symptomatic. Some have objected to the steady chug of the syncopated rhythms. This is a symphonic opening a little like that of Mozart’s 40th. At a swift tempo you get a brisk scuff and on with the tune. Slightly slower you can hear what’s happening and a groundswell is set up from which the movement develops. If you like the quick scuff, stay with Kertesz, if you want the steady groundswell go to Neumann. Another notable point comes a couple of minutes in. After a few bars in a faster tempo, Dvorák brings back his opening theme, asking for a return to the original tempo and with the additional marking grandioso. In Kertesz’s day the view was still prevalent that Dvorák was a sort of simple-minded peasant with a gift for writing pretty tunes. Kertesz, in his wisdom, “corrects” the composer’s “mistaken” directions and continues at the faster tempo. If you’re used to hearing the music this way you will need to adjust to Neumann, or anyone else who plays what is written. For me, his clear belief that he is conducting a great symphony by a great composer shines through. Turning to the New World, it has to be said that this is one of those pieces - another is Rimsky-Korsakov’s Scheherazade - which has provided an entry-point to the world of classical music for countless listeners. While symphonies 5-8 seem self-renewing experiences, I’m not sure that the New World has anything more to say after a certain number of hearings. If I have to listen to it at all, I’d as soon hear Neumann’s as anybody’s. I’m sure that this powerful performance, tough yet lyrical with a broad, strongly-felt slow movement and excellent dance rhythms in the scherzo, will cast the right spell on any newcomer. Neumann takes nearly two minutes longer over the first movement of the 4th than in his early Prague SO version. The Beethoven-inspired opening theme seems only just on the right side of a plod, but the lovely second theme flows warmly and lyrically. Going back to the old version, I appreciated the full-blooded urgency of the opening, but the second theme seemed hustled, almost frog-marched. The romantic solution might be to try two different tempi but this was never in Neumann’s book. Marginally, I prefer his later thoughts. Differences are minimal in the other movements, with the newer version faster but by a very few seconds. The slow movement had a natural flow before and still has, while the lyrical second theme of the finale gets exceptionally affectionate treatment this time. In the 3rd, Neumann’s first movement is just two seconds longer than the old Smetac(ék. For much of the time they seem interchangeable. If Neumann appears a little more cunning in his pacing of climaxes - this is a youthfully thrilling but very noisy movement - this may just be because the earlier recording now sounds very congested. Neumann is considerably faster in the second movement, though. Smetacék digs into this Eroica-inspired funeral march rather like late Barbirolli conducting Elgar. It convinces for a while but ultimately the musical material cannot support such treatment. On the other hand, neither can Neumann’s more flowing tempo prevent it from sounding far too long. In truth this early symphony, after its rather wonderful first movement, doesn’t add up. In the finale - there is no scherzo - it’s Smetac(ék who is the faster. I always felt that, for all his panache, the music sounded uncomfortably like Offenbach and on the whole I prefer the jauntier Neumann approach. I don’t have Neumann’s earlier Prague SO versions of nos. 1 and 2. As I recall, one or other or both had severe cuts - it came as a surprise when the uncut Kertesz versions revealed these as the longest Dvor(ák symphonies. Neumann does what he can with them. It has to be admitted that the first four Dvorák symphonies don’t really stand up as well as the first three of Tchaikovsky which, whatever their weaknesses, sound like Tchaikovsky in every bar. I find it hard to forgive those conductors who think Dvorák wrote only three symphonies - better that than thinking he wrote only one, I suppose - but the absence of the first four Dvorák from most conductor’s curriculums is more understandable. A word about repeats. Conductors who train at the Prague Conservatoire are informed as a matter of course that there exists a manuscript score of the 6th symphony in which Dvorák himself crossed out the first movement repeat, adding the comment “Away with these repeats for ever!”. In fact, there are no first movement repeats in the 7th and 8th symphonies, though the New World has one. Mindful of this, Czech conductors, Neumann included, do not observe the first movement repeats in those symphonies that have one. Dvorák’s feelings are clear enough though there are still some critics who regularly trounce conductors who omit the repeats. Kertesz plays all the repeats if you want them. The Symphonic Variations are an outstanding display of musical and orchestral finesse. In the Symphonic Poems Neumann is able to combine Talich’s symphonic strength with Chalabala’s story-telling gifts. Given that Dvorák’s orchestral colours are at their most brilliant in these works and need to be properly heard, I think Neumann, in combination with the excellent recording, superseded his predecessors here. He also opens up the cuts that were traditionally made in The Golden Spinning Wheel, so if you’re used to Talich or Chalabala - or Beecham - you’ll hear about five minutes more music, by no means limited to developments or extensions of the themes you know. Most or all modern recordings from Kertesz onwards are uncut, however. I hope I have made it clear that this set has broadened my knowledge and love of the composer. I think it also demonstrates that the Neumann era did not bring about a decline in either Dvorák interpretation in Prague or in the standards of the Czech PO, which is magnificent throughout. On the other hand, I have tried to note certain features of Neumann’s work that have caused disappointment for some, and I hope readers will be able to work out whether they are likely to respond to this particular style of unspectacular, unmannered yet deeply convinced music-making, splendidly recorded in a warm acoustic. The notes by Vlasta Reitterová are good, and well translated by Hilda Hearne. Almost a pity, really. We did so love the Supraphon “English” of those old LP jackets. More seriously, we can look back with nostalgia to some of the old Supraphon covers, not to speak of the Brueghel paintings Decca chose for the Kertesz cycle. The “design” by Miloslav Žácek, illustrated above, will not, I suggest, win over hesitating customers.